If you are just entering house-hunting hell starting your house-hunting journey and are looking for helpful organizational information, start here, and then come back to this post. 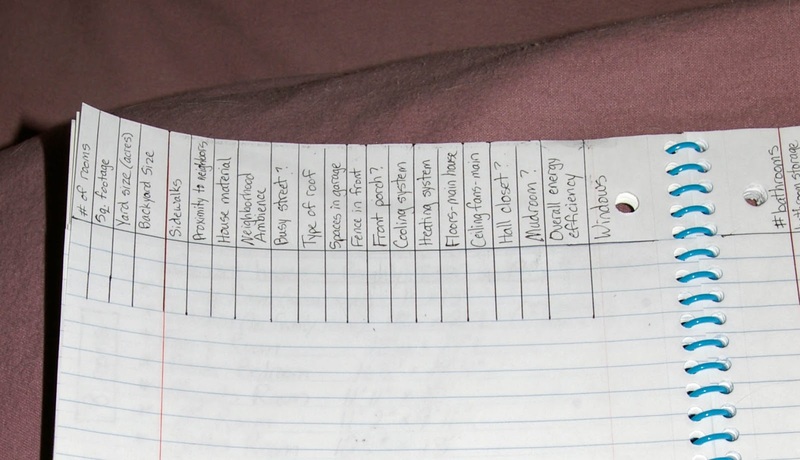 Thanks to all of your great suggestions, I think I finally have all of the headings I need for my keeping-track-of-all-the-details-of-NUMEROUS-houses chart! 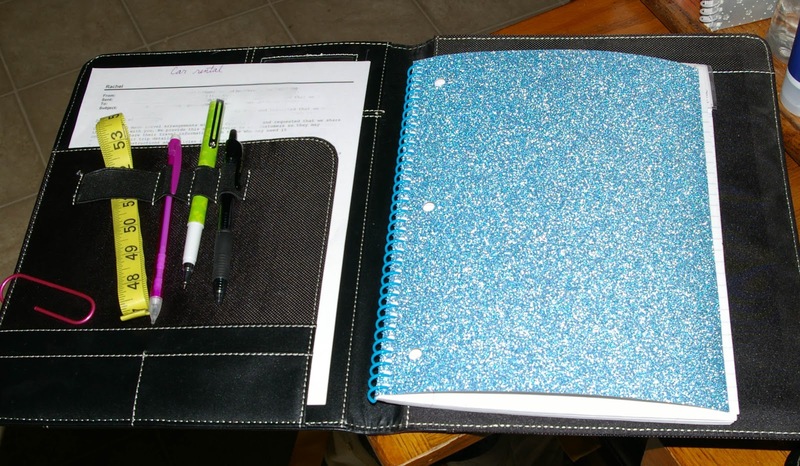 If you are the kind of person who is going to think, "But, DoingMyBest, you can just print all of those house descriptions and put them in a 3-ring binder and then you don't have to go to all of this trouble!" 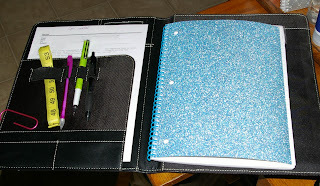 or, "But, DoingMyBest, it would have been more economical to use one of the notebooks you bought for $0.15 during the back-to-school sales than to spend THREE DOLLARS on a notebook just because it was pretty!" then this is not the post for you. If you are someone who finds comfort in picking out a pretty, new notebook and making a soothing chart for a challenging occasion, READ ON. I had to go to T*rget for something, so, having recently decided I should get organized for this house-hunting trip, I decided I would look for a pretty notebook to help make this job more bearable. Before I made it to the notebook section, I found an end display of some bright, cheery office supplies. 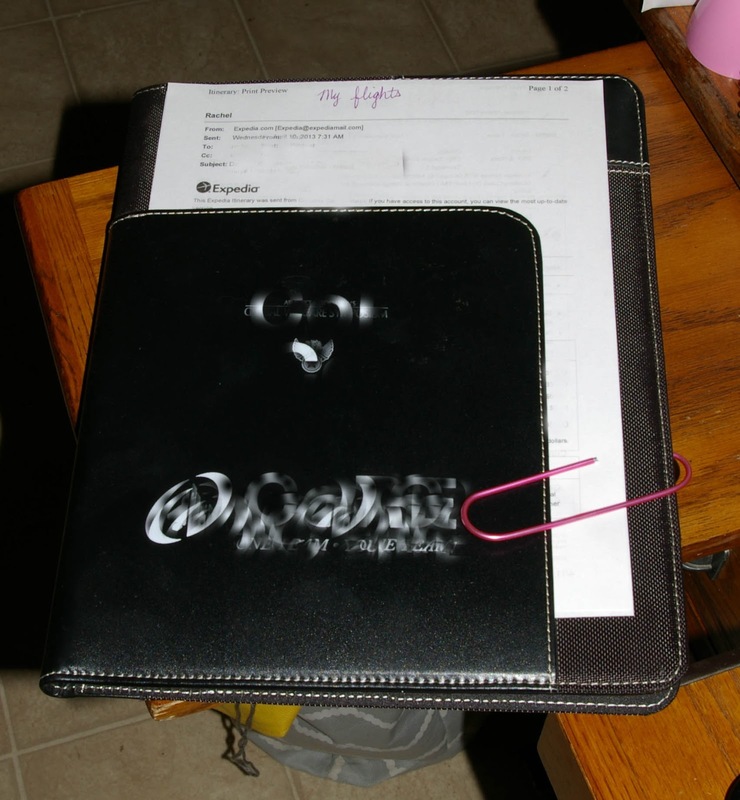 One of the things made in that cheery design was a clip board/folder sort of thing. There was a clipboard on the front, but you could open it like a folder and there was a notepad inside. I was HIGHLY tempted because I liked the pattern and I thought that a clipboard might be useful, and then I was even MORE tempted when I found a similar one on clearance for 1/3 of the price! But I was a little concerned that the notepad might not give me enough space for all of the information I wanted to keep track of, and then I noticed that these things were called "portfolios" and I remembered that Husband had brought something similar home from a conference and given it to me...and it was still sitting underneath my desk at home. 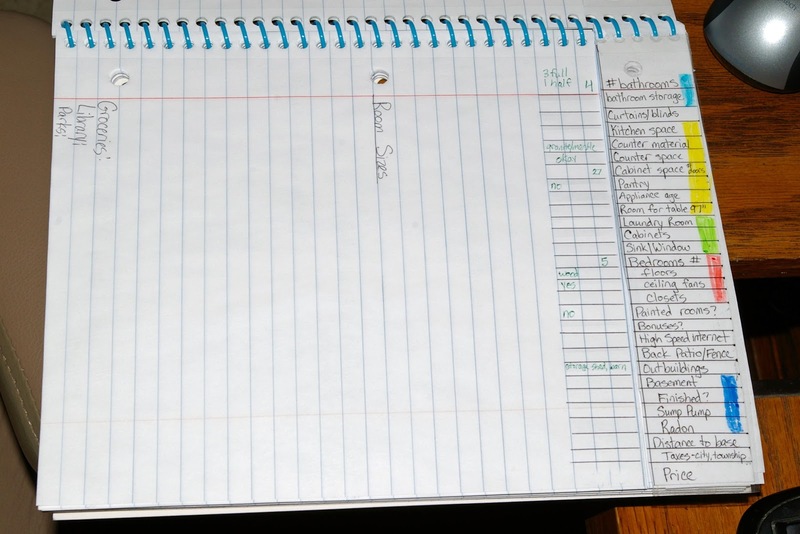 One of the portfolios had a graph paper notepad, and I thought a graph paper notebook would be helpful for this chart, but I couldn't find one. 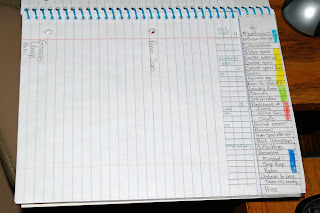 I DO have some graph paper, lab book type notebooks at home, but they aren't pretty. 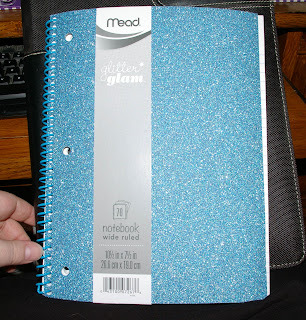 I was concerned that it would shed glitter everywhere, but it doesn't! On the inside cover, I am writing the names and phone numbers of those who live in the area I will be visiting, who have offered to help. On the first page of paper, I am making a list of the different areas in which I am looking for houses because I cannot seem to remember to save my life and it is necessary to ask Husband every time I need to know. I skipped a few pages (in case I need them for something later) and then listed out the room dimensions of our current house, so I can more easily compare these spaces to the other houses. I did not want to have to write the list of information at the top of the page for each of the MANY houses I need to keep track of, so I carefully cut the top part of the pages on the right side, so that I can flip the bottom part of the page, but the list of information I need stays up at the top. I decided to turn the page twice to start the information for a new house, so that the writing from the previous house doesn't show through and distract me. If I need to HEAVEN FORBID I can go back and put house information on the pages I left blank PLEASE DON'T LET THERE BE THAT MANY HOUSES!. I decided I'd better reinforce the top part of the page that has the list, so I put clear packing tape on the front and back and then trimmed it. Then I added some colors (because I forgot to do that before I put tape over it, oops), so that I could easily see which groups of information were related. For example, I have a column labelled "laundry room" and the two columns after that are "cabinets" and "sink/window"; since I am wanting to know if there are cabinets, a sink, and a window in the laundry room, I put the same color on the end of each of those columns. On the right side page, I will write the room sizes, and, on the last 3 lines, the distance to the closest grocery stores, library, and parks. At the bottom of each left side page, I am writing the address and listing number of the house. Above that, I am making a pros and cons list. 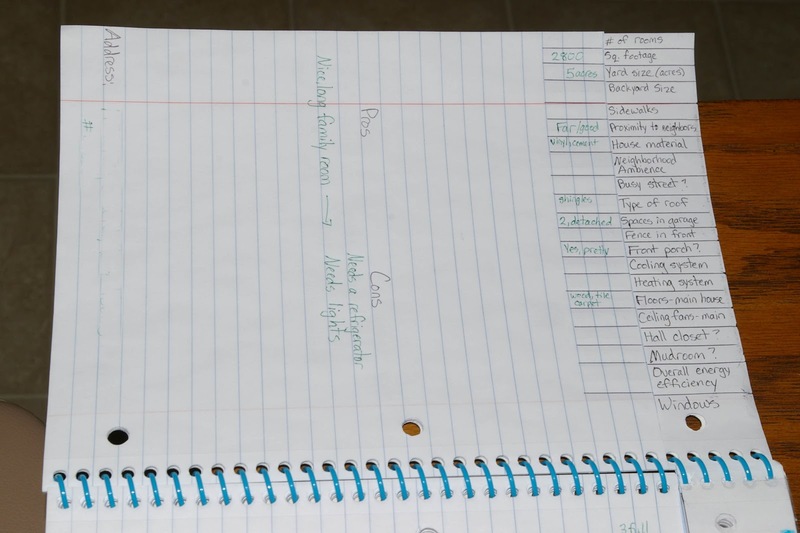 There is enough room left on the pages for me to make notes while I'm visiting each house. I used green ink to fill out the information I could find online about each house; when I visit the houses, I will use blue ink. Edited to add: I also need to find a spot for "Slope of the ground from the house", "Signs of water damage", and "Property taxes". A Lovely Person gave me a giant paperclip for when I need help holding things together. I THINK NOW WOULD BE ONE OF THOSE TIMES. Call or text if you need random opinions! 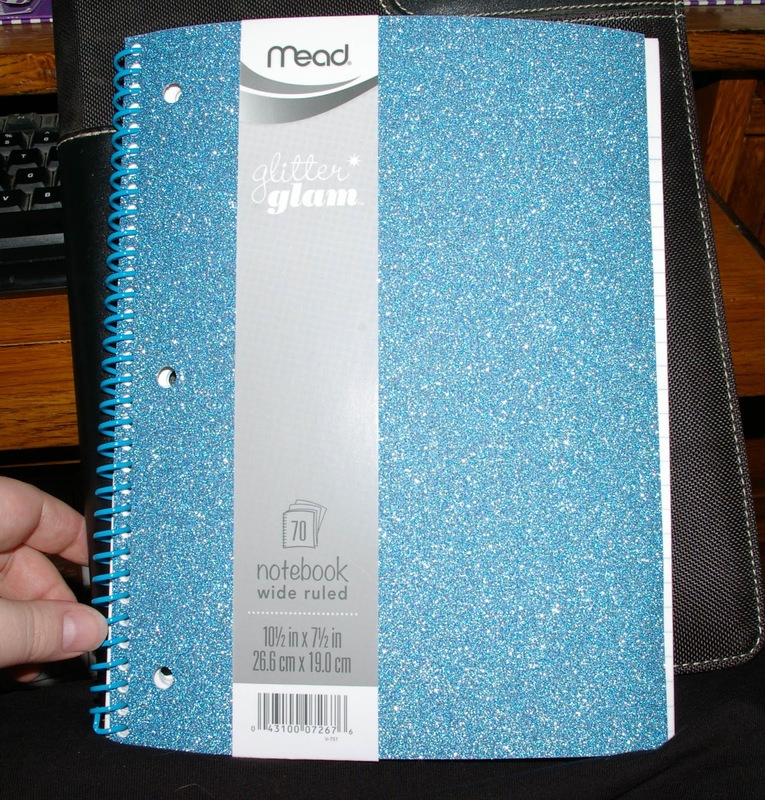 I am lusting after the notebook! Still Playing School-It comes in different colors too! Pink and...silver? I don't remember, but there were other colors! Nice work! I especially like the part about cutting off the page tops so you don't have to write the headings over and over. You make fantastic charts. I hope your trip goes well! Clearly, if I ever need to house shop again, I'm taking you with me. You are a genius! 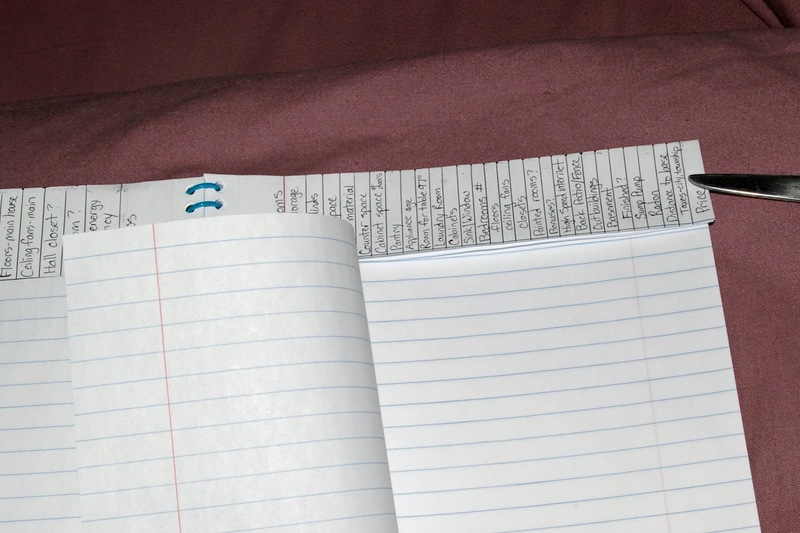 The cutting of the top part so you don't have to write it on each page? GENIUS! Oh how I wish I could join you for the house hunting tour ... if I'm up for a long long car ride, I may just show up! As @StillPlayingSchool can attest, this is the kind of thing that makes me weak in the knees. Absolutely beautifully done!! I cannot WAIT to see it filled in! !